PCMedik instantly makes your computer faster and fixes common problems associated with frustrating slowdowns and errors. Do you remember when you first turned your brand new computer on and how fast it worked With PCMedik and a click of the mouse you can bring back this speed to your computer instantly. PCMedik quickly scans your computer for common problems and fixes them it then makes several permanent changes to Windows so your computer feels like it is brand new once again. Dont deal with a slow computer and make tasks take longer to complete install PCMedik and make your computer run faster. Over time as you install new and updated software you get the impression your computer is slower due to these applications being more demanding of faster hardware. 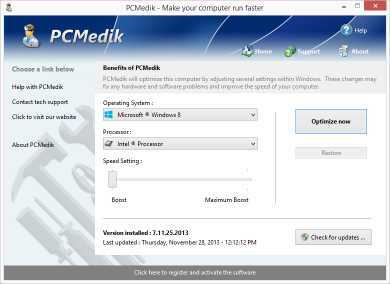 PCMedik makes your computer faster by making several changes to Windows settings for instance it turns off several animations that degrade performance instructs the CPU how to prioritize background tasks how files are loaded and written to the hard drive changes to the way memory is used when programs use the memory swap file and dozens of other performance settings. With these system changes made to Windows and the fixes to common problems your computer will run faster and operate like it is brand new. 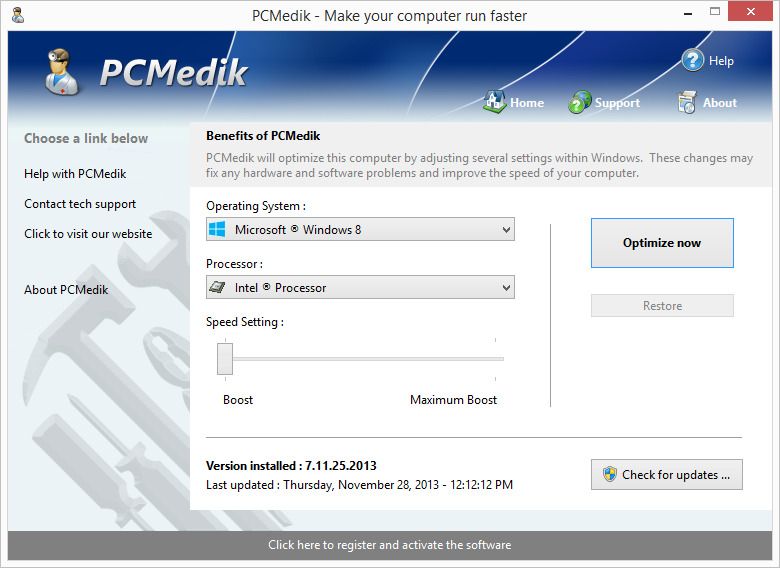 PCMedik is one of the easiest to use PC optimization utilities available on the market.  We designed PCMedik to be very easy to use allowing a novice computer user to simply install our software click a single button and reboot the machine for an instant speed increase. While our software may appear very simple it is extremely powerful on the inside and instantly fixes many of the common computer problems and makes permanent changes to your system intelligently. PCMedik has a built in system analyzer and diagnostic engine which quickly locates problems and fixes them and we constantly update our software to provide you with new improvements.fast.